Good Syndrome, also known as thymoma with immunodeficiency (TWI), is a rare acquired condition with <200 cases reported in the literature., It is an immunological disorder characterized by the association of thymoma, low to absent B cells in peripheral blood, hypogammaglobulinemia, and variable defects in cell-mediated immunity. Morbidity and mortality in patients with Good Syndrome appear to be attributed to secondary complications such as infectious, hematologic, and autoimmune diseases. Here, we report a patient with metastatic thymoma and myasthenia gravis with clinical and laboratory findings matching the diagnosis of Good Syndrome presenting to the dermatology clinic with extensive onychomycosis. 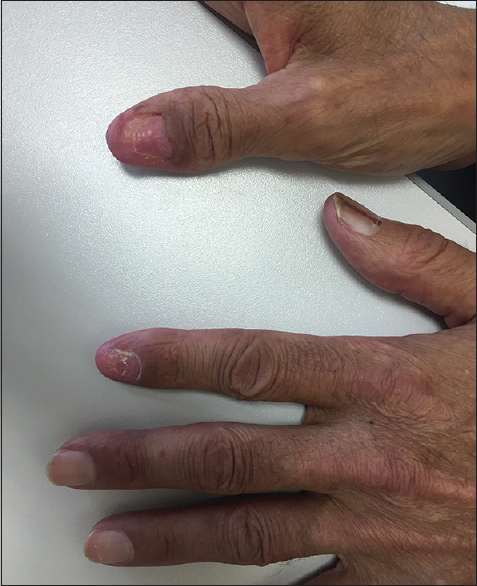 A 53-year-old Saudi male who presented in April 2018 to the dermatology clinic with extensive subungual hyperkeratosis with white nail plate (leukonychia) of the left index and right thumb for the last 6 months. Nail clipping for potassium hydroxide and culture was obtained which came positive for Candida albicans, thus confirming the diagnosis of onychomycosis. The patient was then treated with amorolfine 5% topical solution twice daily. One week later, both nails had spontaneously detached from their nail bed [Figure 1]. His past medical history included seropositive generalized myasthenia gravis diagnosed in 2005 in which he was started on prednisolone 15 mg daily, azathioprine 100 mg once daily and pyridostigmine 60 mg four times a day. A thymoma was diagnosed and resected in 2006 followed by three cycles of radiotherapy and chemotherapy including adriamycin and cisplatin. He subsequently developed a recurrence in 2009 and received six cycles of adriamycin and cisplatin. Two years later, he had another recurrence, and it was resected. He was also treated with partial pleurectomy and resection of a mediastinal mass in 2014 followed by left thoracoscopic excision of pleural mass in 2015. One year later, paraesophageal and pericardium deposits were found, and he underwent metastasectomy followed by left thoracotomy and metastatic pleural deposit resection in the same year. His history also included pulmonary nocardiosis diagnosed in 2017, for which he was treated with long-term trimethoprim/sulfamethoxazole; herpes labials were diagnosed in 2018, for which he was treated with acyclovir. He has a history of frequent admissions to the hospital because of healthcare-associated pneumonia; the last was in February 2018 where he presented to the emergency department with two days history of shortness of breath, fever, and productive cough. He underwent a sputum culture that showed Aspergillus flavus and scanty growth of normal respiratory flora and was started on imipenem, azithromycin, and oseltamivir. His recent investigations included a chest computed tomography (February 2018) which showed stable findings and a pulmonary function test (April 2018) that revealed a severe restrictive lung pattern and significant air trapping. Immunologic analysis showed lymphopenia 6.95% (reference range, 28.00%–39.00%), very low CD4 absolute but normal relative count of 222.00 cells/mcL (reference range, 700.00–1100.00 cells/mcL), very low CD8 absolute but raised relative count of 242.00 cell/mcL (reference range, 500.00–900.00 cells/mcL), critically low B cell count of 3.0 cells/mcL (reference range, 200.0–400.0 cells/mcL), very low NK cell count of 18.0 cells/mcL (reference range, 200.0–400.0 cells/mcL), and reduced CD4/CD8 ratio 0.92 (reference range, 1.00–1.50). His blood smear showed a normochromic anemia with polychromasia, neutrophil was seen with toxic granuloma and normal platelets. Patients with Good Syndrome are at increased risk of death with a greater mortality rate compared to CVID, mainly secondary to infections, autoimmunity, and hematologic complications., A high index of suspicion and appropriate investigations are crucially important for early identification and management of Good Syndrome. The management involves resection of the thymoma, intravenous immune globulin, treatment of associated complications such as infections and autoimmune disorders. In addition, live vaccines should be avoided where possible as they may be a serious threat to patients with Good Syndrome. In conclusion, we identified a patient with Good Syndrome diagnosed with extensive onychomycosis caused by C. albicans. The patient had a history of excised thymoma and myasthenia gravis. Further laboratory investigations showed very low B-cells, CD4 helper T-cells and reduced CD4/CD8 consistent with the described abnormalities associated with Good Syndrome in the literature. We propose that unusually extensive or severe onychomycosis may be a guide to consider a primary acquired immunodeficiency such as Good Syndrome. Rising the awareness may lead to earlier recognition, hence, avoid complications and possibly decrease morbidity and mortality in patients with Good Syndrome and related conditions. Sasson SC, Davies S, Chan R, Davies L, Garsia R. Cerebral toxoplasmosis in a patient with myasthenia gravis and thymoma with immunodeficiency/Good's syndrome: A case report. BMC Infect Dis 2016;16:457. Malphettes M, Gérard L, Galicier L, Boutboul D, Asli B, Szalat R, et al. Good syndrome: An adult-onset immunodeficiency remarkable for its high incidence of invasive infections and autoimmune complications. Clin Infect Dis 2015;61:e13-9. Kelesidis T, Yang O. Good's syndrome remains a mystery after 55 years: A systematic review of the scientific evidence. Clin Immunol 2010;135:347-63. Good RA, Varco RL. A clinical and experimental study of agammaglobulinemia. J Lancet 1955;75:245-71. Bonilla FA, Bernstein IL, Khan DA, Ballas ZK, Chinen J, Frank MM, et al. Practice parameter for the diagnosis and management of primary immunodeficiency. Ann Allergy Asthma Immunol 2005;94:S1-63. Tarr PE, Sneller MC, Mechanic LJ, Economides A, Eger CM, Strober W, et al. Infections in patients with immunodeficiency with thymoma (Good syndrome). Report of 5 cases and review of the literature. Medicine (Baltimore) 2001;80:123-33. Bonilla FA, Khan DA, Ballas ZK, Chinen J, Frank MM, Hsu JT, et al. Practice parameter for the diagnosis and management of primary immunodeficiency. J Allergy Clin Immunol 2015;136:1186-2050. Joven MH, Palalay MP, Sonido CY. Case report and literature review on good's syndrome, a form of acquired immunodeficiency associated with thymomas. Hawaii J Med Public Health 2013;72:56-62. Ueno S, Sekimoto-Tsuboi S, Ishiguro Y, Koinuma T, Eguchi H, Machida Y, et al. Good's syndrome with opportunistic infection of the central nervous system: A case report. BMC Neurol 2015;15:150. Hermaszewski RA, Webster AD. Primary hypogammaglobulinaemia: A survey of clinical manifestations and complications. Q J Med 1993;86:31-42.